Fr. 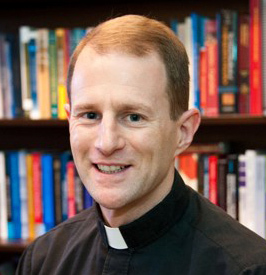 Matthew Carnes, S.J., is an associate professor at Georgetown University in the Department of Government and the Edmund A. Walsh School of Foreign Service, and he currently serves as the Director of the Center for Latin American Studies. His research examines the dynamics of labor and social welfare policy, with particular interest in the ways societies protect their most vulnerable members: the old, the young, the ill or injured, and the unemployed. His principal regional focus is Latin America, and in recent years he has conducted extensive field research in Argentina, Peru, Chile, and Bolivia. In 2011, he was awarded the Dorothy Brown Award for Outstanding Teaching Achievement, Georgetown University’s highest teaching award, presented by the student body to the faculty member who has had the strongest impact on the students' university experience. In addition, in 2011, at the Tropaia Ceremony for Georgetown College, he was awarded the Edward B. Bunn, S.J. Award for Faculty Excellence, given by the graduating seniors in the College of Arts and Sciences. In 2012, he was featured as one of the country's best professors in the Princeton Review's publication, 300 Best Professors. And in 2013, he was chosen by students as the Faculty Member of the Year in the Edmund A. Walsh School of Foreign Service. In recent years, he has been a Visiting Fellow at the Kellogg Institute for International Studies at the University of Notre Dame (Spring 2009) and a National Fellow at the Hoover Institution at Stanford University (Academic Year 2011-2012). He is the author of Continuity Despite Change: The Politics of Labor Market Regulation in Latin America.